For my first Photoshop project, I chose an adjective that I thought described me well, which was "imaginative". Next, I chose two different colors that were complimentary colors and worked nicely together. The colors that I chose were orange and blue. I put lots of space between my photo and the text so that nothing was overlapping, but also so that nothing was too far apart. I left room around the edges so the margins weren't packed tightly together with text. I chose a legible font and size, and I chose vibrant colors for the text that would look good on the neutral blue-green background. I gave Erin the best quote award because her quote was very inspirational and thoughtful. She also had a good picture and a good good Photoshop Project in general. I also think that Erin chose a good, strong adjective that defines her very well. I made my current issue project in Photoshop about feminism and about how men are treated better and taken more seriously than women. I based my project off of an infographic and I only used to pictures to get my point across. 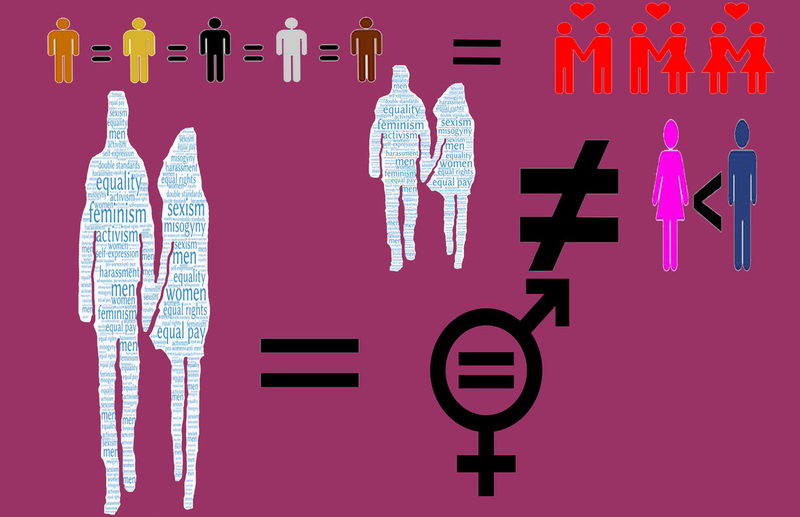 I also made the silhouette image of the man and the woman holding hands, and I added in all of the words that are on their bodies. Finally, I used lots of equal and not equal signs to express how society treats people and how they should actually be treated, which isn't always with equity and fairness. I made a Minecraft world with Najaya and we had lots of fun making it. We made a huge house and a rollercoaster that gets you through the whole world. For my final project, I made a video surrounding the results of the election with Najaya and interviewed people on their thoughts about the election. I'm really proud of working in Photoshop and learning the functions of how to use it. I'm also really proud of making the movie that Najaya and I made because we worked really hard on it and I think it turned our really great. I also enjoyed working with my friends and having a chill workspace where you can kind of choose what you want to do for your trimester. I am additionally proud of the infographic that I made about feminism because I felt like the images I used needed to be addressed in today's society. If I could add one thing to the class, it would to be to have more of an open free time to choose the entire trimester for what you want to do, like do a project in Photoshop, a Carvey, a 3d print, etc. Other than that, I had a great time in Media Arts this year and I plan to be in Advanced Media Arts next year!